These books work on a level that all other guides fail. First off, we’re presented with films that, although possibly featured elsewhere, are now given a fresh perspective from one of its fans. Films that we may have seen in the past but had forgotten about. Or maybe those we’ve never seen but need to. Because we have 101 authors here, we also have 101 different viewpoints on these films that probably would’ve had totally different results had there been only one author throughout. What makes “Hidden Horror” so much fun is that we don’t just get a review of the movie. but also a back story; the story of the author and what was experienced when seeing the film for the first time. These are stories I can definitely relate too since I experienced many of the same things, thereby making the book totally relatable. 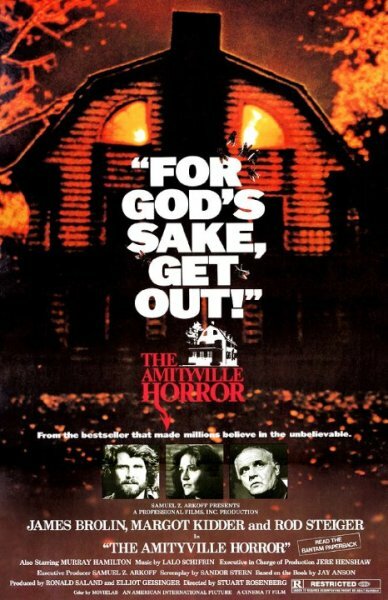 When an author talks about his father taking him at a very young age to see the film he’s reviewing, I recalled my mom taking me to see THE AMITYVILLE HORROR during its original release in 1979, when I was 12 years old. Though this may not be one of the greatest horror films of all time, at that age I was highly impacted by it and it was truly the first horror movie I’d ever seen at the theater. To this day I still have memories of how this movie scared the hell out of me. 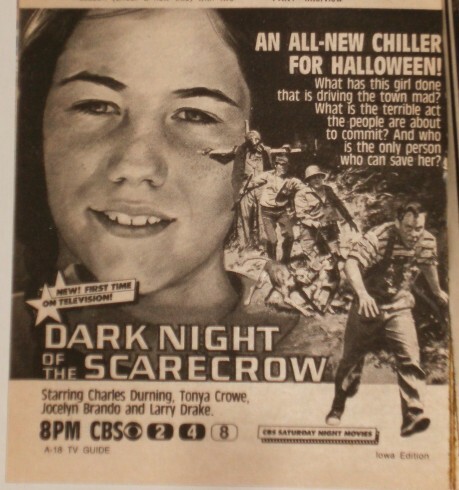 How many of us remember sneaking downstairs as kids to watch a late night horror movie on the only television set in the house, having to keep the volume down low so as to not wake anyone else up in the house up? This is how I saw the 1973 film THE CREEPING FLESH for the very first time. Who remembers getting the TV Guide every week and going through each listing and highlighting all the monster movies slated for that week? I know I do and I know I’m not alone, as many of this book’s authors did the very same thing! These people are just like us, the readers. They are monster kids through and through with a passion for the same things we like. These are the people we wish we’d had around as kids so that we could have share these experiences with them. 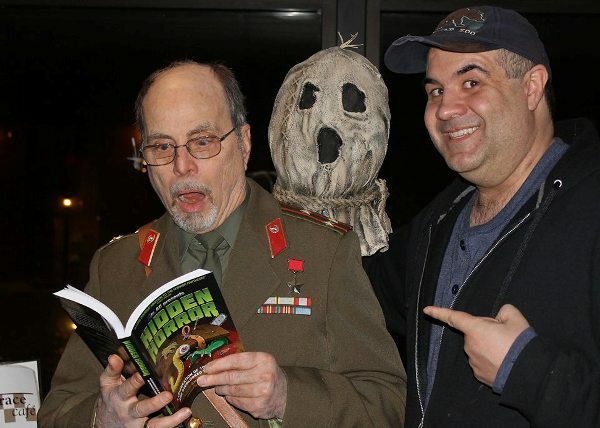 Another highlight of this book is the entry by Terror Dave Fuentes, discussing one of his all-time favorite films, DARK NIGHT OF THE SCARECROW. Readers of this site should be familiar with Dave’s love of the 1981 television film but he best explains it in the book. If you’ve not seen the movie, you really should buy it and check it NOW! You can buy your own copy by clicking HERE! I’ve found myself reading this book with the Amazon site open next to me on my laptop, regularly adding to my cart as I get further and further into this amazing book! Terror Dave Fuentes with the writer of DARK NIGHT OF THE SCARECROW, J.D. Feigelson. If you would like to order this book, you can do so by going HERE. You can also order Aaron Christensen’s other book, “HORROR 101,” by going HERE! Also, look for your chance to win a copy along with other great prizes in an upcoming Terror Dave contest! Now what are you waiting for? Go buy this book! This entry was posted in Book Reviews and tagged A.C. Christensen, Daev Fuentes, DARK NIGHT OF THE SCARECROW, Hidden Horror: A Celebration of 101 Underrated and Overlooked Fright Flicks, HORROR 101, J.D. FEIGELSON, The Amityville Horror, The Creeping Flesh, William Lustig. Bookmark the permalink.